I thought since I’m a Windy City writer I’d start a Wednesday walking tour. Each week I’ll do my best to show you a Chicago landmark or maybe some hidden gem that only those of us lucky enough to call Chicago home would know about. This week I’ll start with a place that draws many tourists, it’s located in Grant Park and only one of the many open spaces along Lake Michigan. Many people don’t know that after the great fire in 1871 and the 1893 World’s Columbia Exposition, Chicago was a planned city. The Burham Plan was enacted in 1909 that allowed for wider streets, new railways, harbor facilities and civic buildings and because of the success of the world’s fair many ideas were presented for improving and preserving Chicago's lakefront. Buckingham Fountain is a Chicago landmark at the edge of Grant Park. Dedicated in 1927, it is one of the largest fountains in the world. Built in a rococo wedding cake style and inspired by the Latona Fountain at the Palace of Versailles, it is meant to allegorically represent Lake Michigan. The fountain itself represents Lake Michigan, with each sea horse symbolizing the states of Illinois, Wisconsin, Michigan and Indiana, that border the lake. The fountain was designed by beaux arts architect Edward H. Bennett. The statues were created by the French sculptor Marcel F. Loyau. 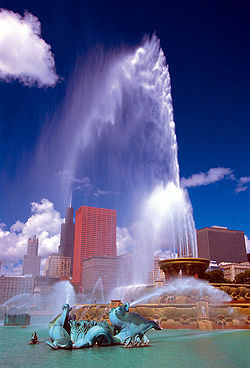 The fountain was donated to the city by Kate Buckingham in memory of her brother, Clarence Buckingham and its official name is the Clarence Buckingham Memorial Fountain. It operates from April to October, with regular water shows and evening color-light shows. During the winter, the fountain is decorated with festival lights. I’ve seen Latona Fountain and Buckingham is more beautiful probably because of the Georgia pink marble that really stands out in the sunshine against the blue skyline and water. If you visit make sure you check out the water show, every hour on the hour from now to the middle of October. Lovely picture, Elizabeth. I think the walking tour is a great idea. Thank you for sharing your city with those of us who are unable to travel to it. Thanks for stopping by Kate. I'm going to do my best to make everyone so familiar with Chicago that they feel at home when they finally get to visit. I try to do that in my books set her too. Check back next Wednesday, I think I'll share something out of the way.